2BrightSparks is expert at the task of keeping a single data set stored in multiple locations matched up, a.k.a. in sync. The company's flagship sync utility for PCs is SyncBack. It's available in the $40 SyncBackSE 7 and the $55 SyncBackPro, which adds syncing with online storage repositories and other niceties to the mix. 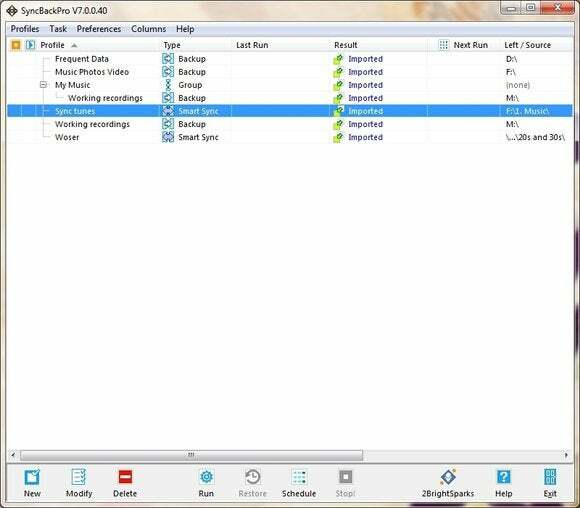 SyncBack makes every attempt to keep the potentially dangerous task of synchronizing your folders and data easy and safe. It has more options than you can shake a stick at, but keeps them safely tucked away in dialogs where new users can't cause havoc with them. Just to name a few: compression, encryption, logging, resumption of interrupted FTP and network transfers, running programs before and after execution, status emails, support for the Media Transfer Protocol, and support for symbolic links. SyncBack provides plenty of options, the current state of which are display in the profile synopsis. SyncBack works via profiles, a.k.a. jobs, for which you define the source and a single destination, choose options, then save. Personally—and especially for syncing—I prefer the single-source/multiple-destination approach. However, SyncBack’s ability to copy profiles and organize them into groups, then run those groups in batches produces the same result, if not quite so neatly. SyncBack offers three basic types of copy/sync jobs: Backup, where files are simply copied to the destination with rules to govern conflicts with existing files (overwrite, rename, etc. ); Sync or SmartSync (which retains older versions of files) which are bi-directional routines that make sure that all the latest files are copied to both directories; and Mirror, which is a unidirectional operation that creates an identical copy of the source directory in the destination directory. 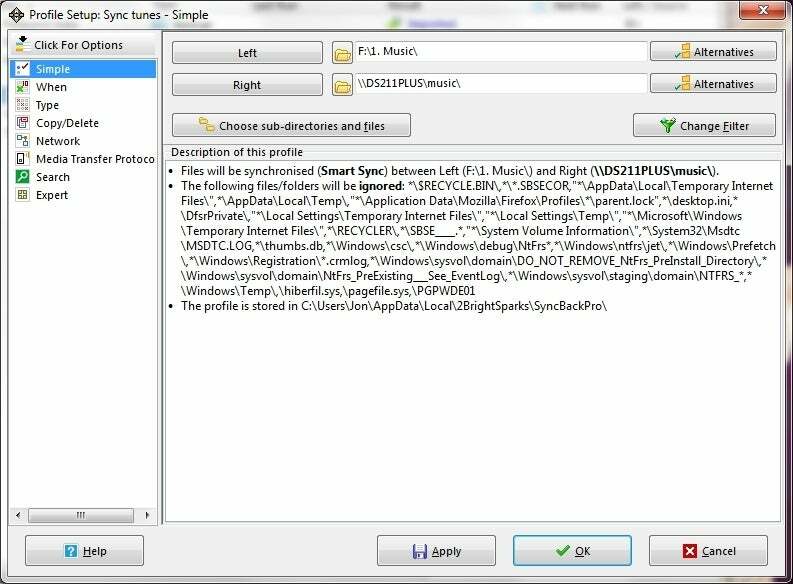 SyncBack also has a filter function that lets you limit which files are copied. Highly useful if, say, you should wish to copy all the jpeg files in a folder, but not the movie files. 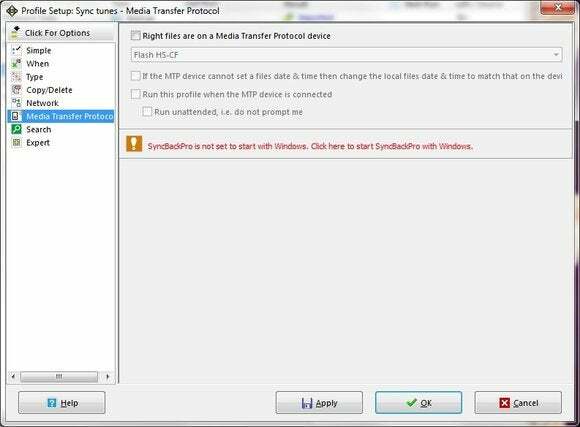 SyncBack also supports Media Transfer Format for dedicated photo and movie transfer functions. You can sync with SyncBackSE to any direct-attached storage, as well network and FTP locations. SyncBackPro adds the online storage destinations, which include Amazon S3, Box, Dropbox, Google Drive, Microsoft Azure, and OneDrive. Both versions of SyncBack 7 can also sync with other devices and PCs running the company’s new SyncBack Touch background service. iOS is not currently supported because of its restrictions on data access. Licenses for Touch are sold in a five-pack for $30. SyncBack’s interface is plain and will undoubtedly appeal to IT types, who generally prefer the straightforward approach. It's easy to use, though the icons could be more intuitive. But the UI needs a bit more pizzazz to sell well in the mainstream. A Windows 8-like interface or similar would work wonders, as it has for the recently released Acronis True Image 2015. SyncBack also suffers a bit from “please everyone” syndrome. E.g. there are options governing even what takes place when you double-click on a profile. Not a huge deal, but at least set it to an initial common behavior first (preferably “edit,” which is almost universal). Bland interface or no, SyncBack, whether -SE or -Pro, is as powerful and versatile a sync program as you’ll run across. It performed flawlessly in every job I threw its way. A more modern appearance would attract more buyers, but handsome is as handsome does and by that criterion, SyncBack is a movie star. The venerable PC syncing tool with the stern interface gets a load of new features, plus the ability to sync data with online storage services. A comprehensive and powerful sync and backup program whose only failing is its outdated look.